Solid mid-priced electric for those fancying a bit of danger. Satisfying sonic character for the metalheads, iconic Warlock shape. Lack of versatility, OTT paintjob. Ah, the BC Rich Warlock: the mere mention of its name is enough to induce fainting in neighbouring villages and have livestock gathering nervously in a corner. For generations of noisemakers, the Warlock has been the go-to instrument for maxing out the metal points and draining colour from concerned parents' cheeks. Looking like it was lifted straight from the set of Conan The Barbarian, it may be the most iconic of BC Rich's aggressively shaped range of guitars - only the Mockingbird comes close. "The body's graphic, a blood splatter on white, gives it a pathology lab vibe." The difference with this one is that it's a signature effort for Joey Jordison, Slipknot's, err, drummer. But let's remember the stick-wielder is a guitarist as well, having written plenty of riffs for the Iowa nonet's abrasive canon and with his own horror-punk outfit, Murderdolls. The body's graphic, a blood splatter on white, gives it a pathology lab vibe. Unlike Joey's stage guitar and drumsticks, though, for which he donated his own blood, this is all paint. 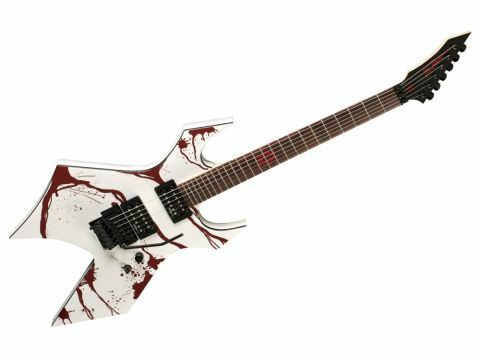 The OTT design doesn't end there, as the Murderdolls insignia marks its territory at the 12th fret, with the blood-red continuing on an 80s-style reverse headstock. You should ask yourself how much of a Joey fan you are if you're considering putting this Warlock on your wishlist. As much as we love signature guitars at TG - and some of the coolest recent designs have come from manufacturers working to an artist's spec - this might be a bit overbearing for individualist shredders looking to carve their own niche. Disregarding the aesthetics, you have a pretty cool shred guitar. So no matter if your proclivity is to wear a DIY face mask made from newspaper, egg whites, cigarette ash and crow feathers when practising or not, you're going to get on with the neck. Sure, unlike its big brother the US-built Joey Jordison Warlock, the neck is bolted on, meaning you lose a bit of sustain and have to negotiate a slightly clunky heel when ferreting around in the guitar's upper registers. Yet the satin finish and slim profile make it more than accommodating - even allowing us cursed with small, fat sausage fingers to let our inner shred-tiger out of its cage. The licensed Floyd Rose locking vibrato is stable enough for the usual squeals 'n' squawks, too. Joey's tone isn't saturated with gain, so it's not such an issue that the twin humbuckers fitted with the Warlock II aren't as hot as the EMG81/85 combo on the US version. Metalheads won't be left wanting, with a warm midrange growl dominating the Warlock II's voice. Its lack of versatility lets it down, but then what self-respecting jazz cat is going to pick this up off the rack? This is for the deviants - the next generation of shredders looking for a mid-priced electric with a bit of danger. Most of all, it's for Joey fans.